Fondue is fun! Case in point? This ultra cheesy, beer-soaked recipe from Christian DeBenedetti’s and Andrea Slonecker’s Beer Bites. 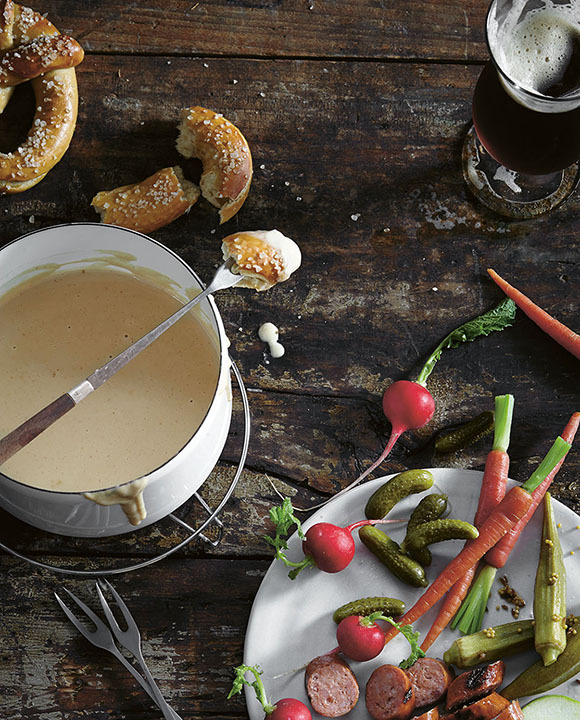 Bring the ale to a boil over medium heat in a fondue pot or a heavy-bottomed 2-qt saucepan. Turn the heat to medium-low. Combine the cheese and cornstarch in a medium bowl and toss to coat. Add the cheese to the ale a large handful at a time, stirring in a figure-eight pattern until the cheese is completely melted before each addition. Have patience; this could take a total of 20 minutes and it is important that the cheese melts slowly and completely. When all of the cheese is melted and the fondue is thick, stir in the mustard, Worcestershire sauce, and paprika. Season with salt. 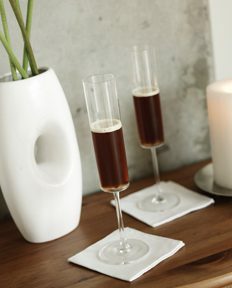 Serve piping hot, from the fondue pot placed over a low flame or the saucepan set on a trivet. (If you’re serving it from a saucepan, you’ll need to return it to a low flame to remelt the cheese once it begins to solidify. Do this stirring gently, again in a figure-eight pattern.) Offer your guests forks or metal skewers for dipping the pretzels, sausages, apples, or vegetables. Reprinted with permission from Beer Bites: Tasty Recipes and Perfect Pairings for Brew Lovers by Christian DeBenedetti and Andrea Slonecker. Published by Chronicle Books.